Today’s bird survey at Kinloch Wild produced some cool bird sightings, but I have to admit the highlight of the morning was stumbling upon this fawn after our survey concluded. Just a day or two old, it was walking along a stone wall without a doe in sight. As I approached, it instinctively dropped down, hiding its head between its front legs so I wouldn’t see it. Gradually, though, the fawn’s curiosity got the better of it, and it began to check me out. After a few minutes it stood up and ambled away, little white tail flashing in the sunlight, as it headed toward the adjacent hay-field where, hopefully, its mother awaited in the protection of the tall grass. 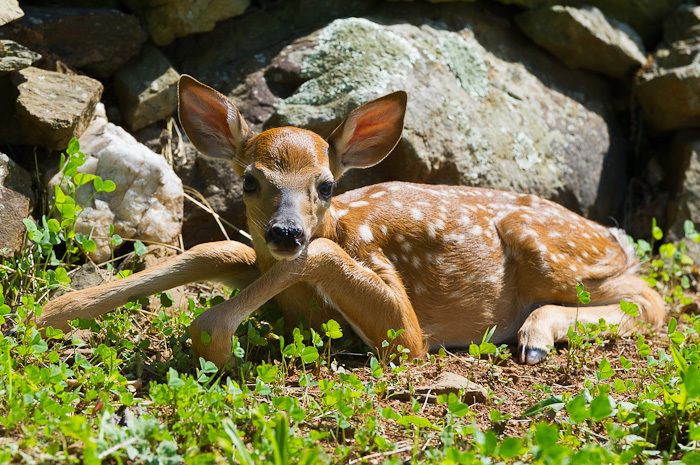 Beautiful little fawn! I would be overjoyed to find a fawn to photograph! I’m always looking, since I have seen deer near our nature trail. Wonderful and precious! Lucky you!!! Lucky for all of us you stumbled upon this great little guy. Thanks for sharing.